Brandon Weinbrenner is the Alley’s Artistic Associate. He made his Alley directing debut in 2013 with Venus in Fur in the Neuhaus and has since directed the workshops/readings of The Supreme Leader, Wife of a Salesman, The End of There, Quack, Roan @ the Gates, Pilgrims, and The Harassment of Iris Malloy all as part of Alley All New. 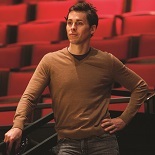 Brandon previously served as the Alley’s Resident Assistant Director, assistant directing over twenty-five productions. Around town he has directed Fool for Love at The Landing Theatre Co, Stage Kiss at 4th Wall Theatre Company, Buyer & Cellar and Native Gardens at Main Street Theater, and will direct The Royale at Rec Room this Spring. Past theatrical credits include serving as the Bret C. Harte Directing Fellow at Berkeley Rep, producing the 2013 Out of the Loop Fringe Festival in his hometown of Dallas, Texas, and acting in productions at the Guthrie Theater, among others. Brandon is a graduate of the University of Minnesota/Guthrie Theater BFA Acting Training Program.